In which Mr B and I take an exotic French-Moroccan cooking class and learn (among other things) the difference between a tagine (the vessel) and a tagine (the stew); plus an awesome recipe for Carrot Salad with Harissa, Feta & Mint! Mr B and I recently took a cooking class together at Sur La Table, and not only did we learn a ton while we were there, but it turned out to be an amazing Date Night too! 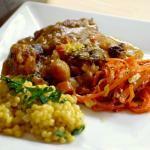 I partnered with Sur La Table to bring you this post. This post may contain affiliate links. 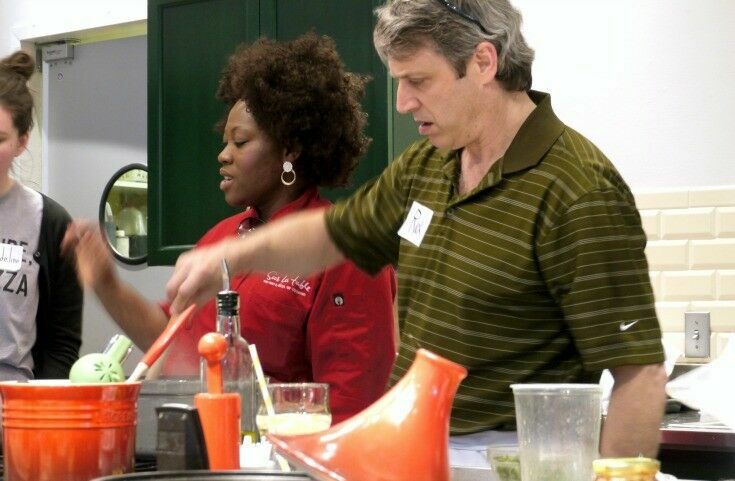 Cooking classes are one of the best Date Nights! 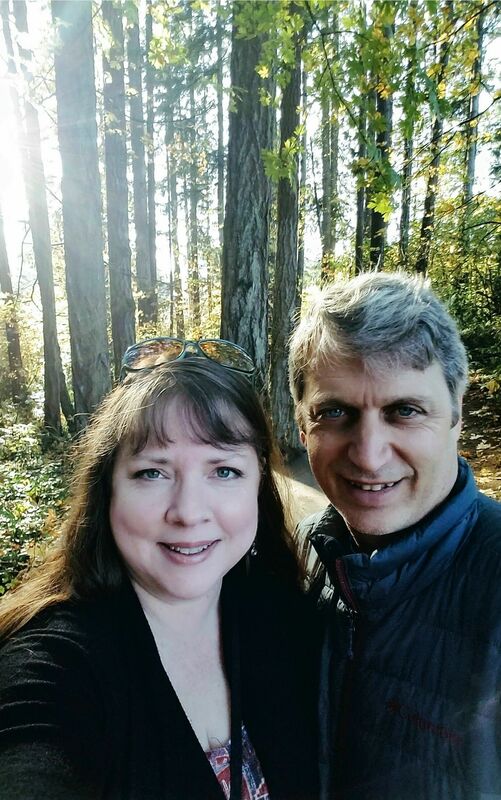 You get to spend time doing something active and interesting with your sweetheart, meet some fun new people, and eat a great meal at the end of the day. 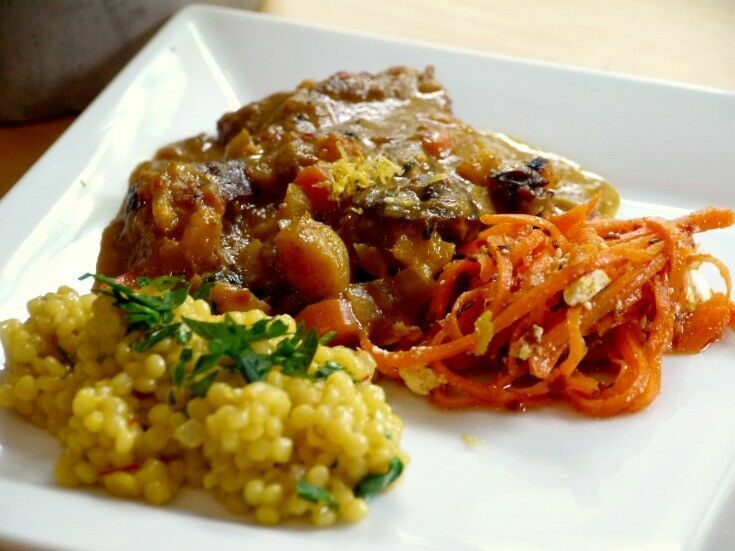 Our class – “Exotic French-Moroccan Cuisine” – was held in the teaching kitchen at Sur La Table in downtown Portland, directly across the street from Powell’s. (Check here to find Sur La Table classes in your area.) Aprons and recipes were ready and waiting when we arrived, and ingredients and tools were strategically placed around the work area. 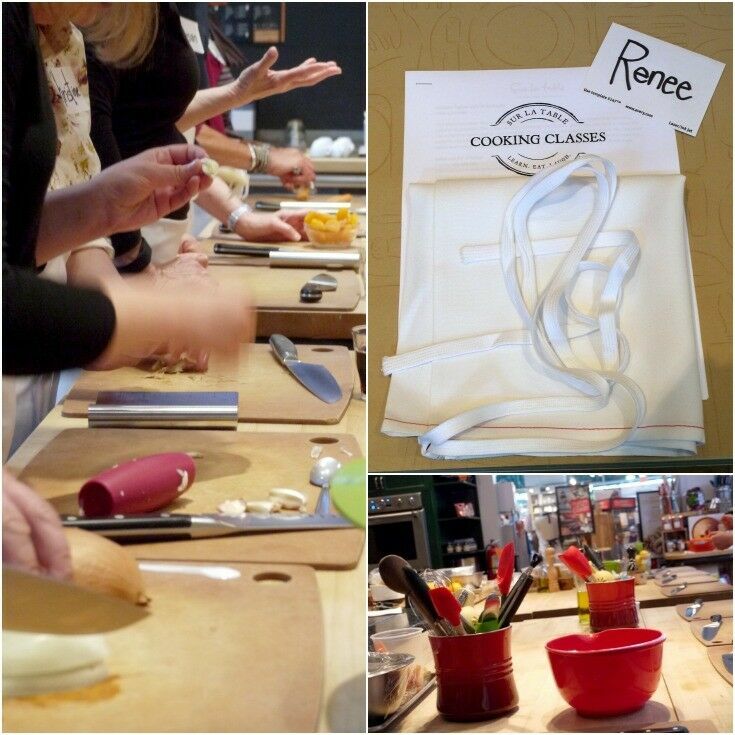 One thing that immediately impressed us about our Sur La Table cooking class was the caliber of instruction. Our instructor for the day was Chef Priscilla Umeda, a beautifully warm, captivating woman with great passion and skill for cooking. 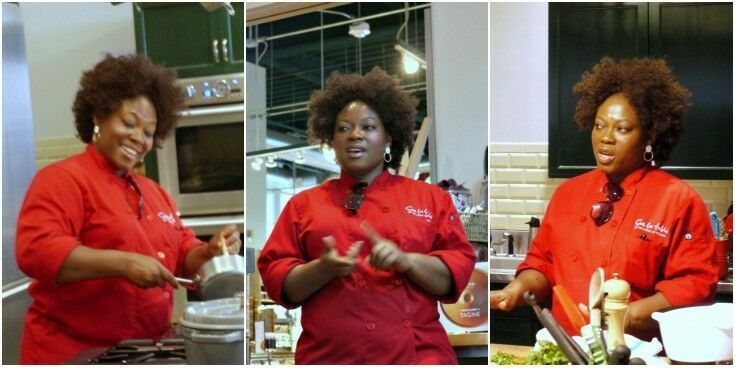 Chef Priscilla, originally from Nigeria, grew up as the oldest female child in a family of eight children, so it fell to her to “insure her siblings were fed.” Thus, the seeds for creating delicious food and educating others in culinary arts were planted early. After earning a degree in Business Administration & Management in Nigeria, Chef Priscilla taught herself the art of cake making that became a thriving business in Nigeria before her migration to America. Now a trained, professional chef, she is actively engaged in the culinary training of both home cooks like us and professional chefs. 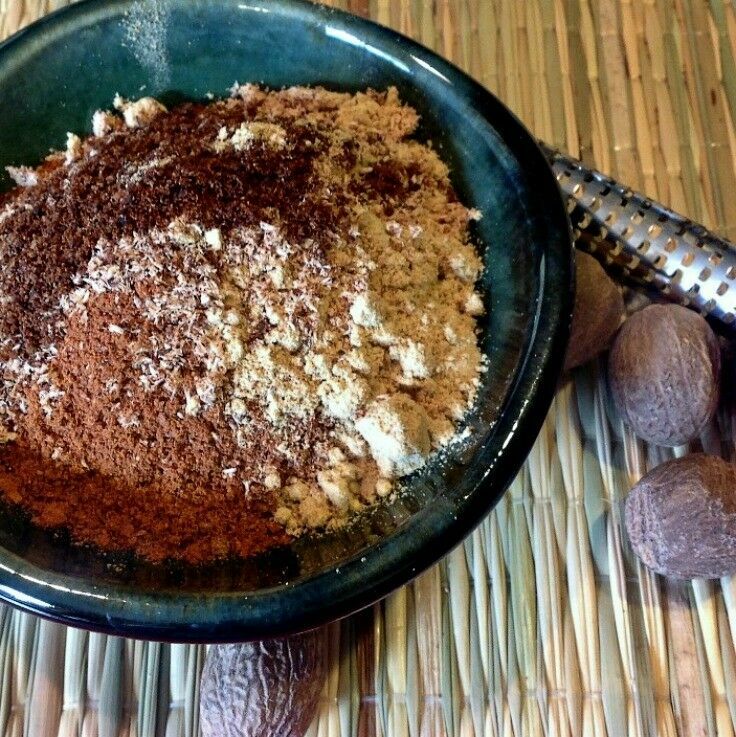 Before we got to work, Chef Priscilla gave us a little history about Moroccan cuisine. We learned that Moroccan cuisine is considered one of the most important cuisines in the world, due in great part to the remarkable diversity of colonizers and immigrants who have influenced it over the last millennia. The cuisine of Morocco’s first inhabitants, the Berbers, still exists today in dishes like tagine and couscous. It took on spices, nuts and dried fruits, and the sweet and sour combinations from Arab invasions; olives, olive juice and citrus from the Moors; pickling from Moroccan Jews; and kebabs from the Ottoman Empire. The short-lived French-Moroccan colony left behind a culture of cafes, pastries, and wine. Chef Priscilla also introduced us to the quintessential hallmark of Moroccan cooking: the Tagine. The word tagine has two meanings. First, it refers to a traditional North African clay-pot cooking vessel. 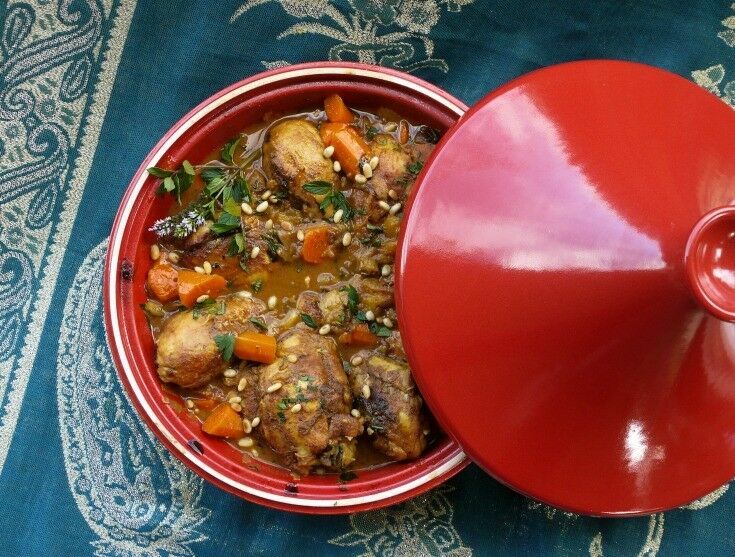 The bottom is a wide, shallow circular dish used for both cooking and serving, while the top of the tagine is distinctively shaped into a rounded dome or cone. Second, tagine refers to the iconic Moroccan stew: created in layers of warm spices, tender meats, fresh vegetables, and dried fruits, tagine is slow-cooked in the aforementioned traditional cooking vessel. Sur La Table offers two kinds of class formats: demonstration and hands-on. Ours was of the latter variety, with everyone taking part in the preparations. Chef Priscilla walked us through four dishes: Chicken Tagine with Dried Fruits, Couscous with Saffron & Ginger, Carrot Salad with Harissa, Feta & Mint, and Cardamom Madeleines with Rosewater Glaze. Chef Priscilla was a master of the Microplane! There were about twenty people in our class, and there was plenty for everyone to do. Mr B jumped right into the action! One of the things I appreciate about Sur La Table’s class philosophy is that they aren’t just about throwing together a short list of menu items, but rather, they aim to teach techniques and send you home with practical advice and information that you can immediately use in your own kitchen. As far as Mr B and I are concerned, every meal needs to include a little something sweet. These Cardamom Madeleines with Rosewater Glaze were as lovely as they were delicious. Mr B and I both loved the fresh, sweet and slightly spicy flavors of this Carrot Salad recipe (shared here courtesy of Sur La Table). 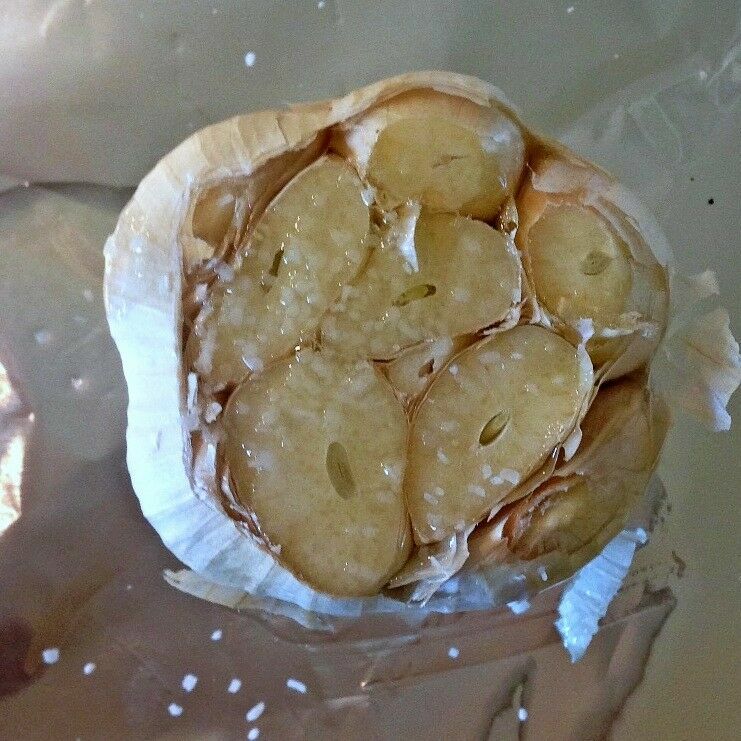 Note that it uses preserved lemons, an indispensable ingredient in Moroccan cooking. Their unique pickled taste and texture cannot be duplicated with fresh products. 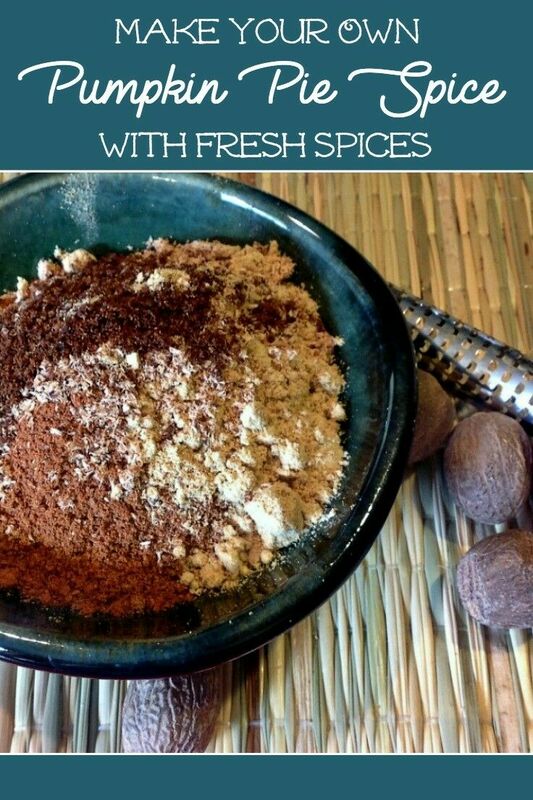 You can buy them in specialty stores, or they can be easily made at home. Heat oil in small skillet over medium heat. 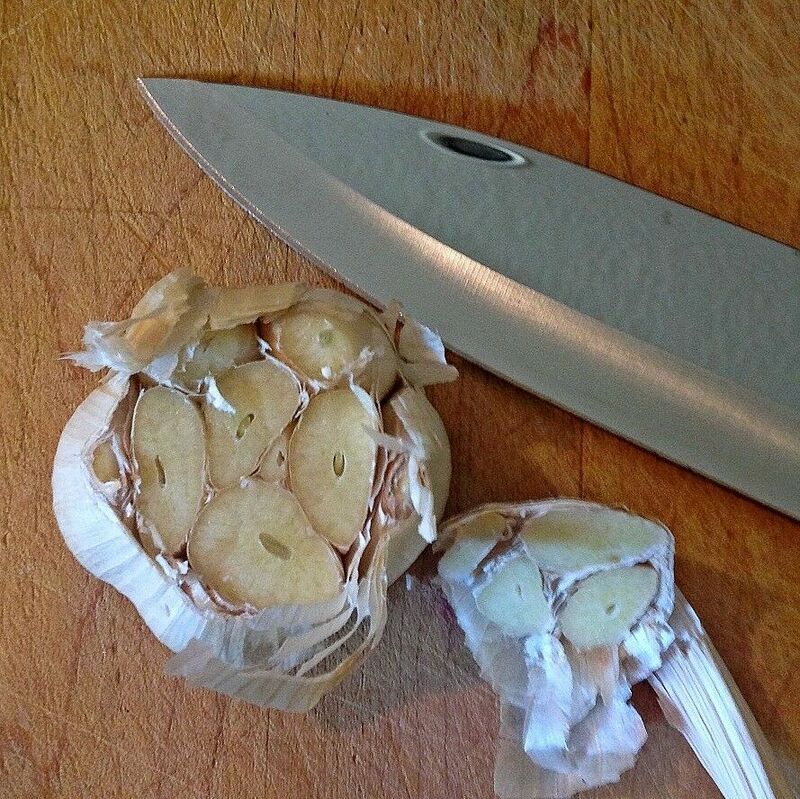 Add garlic, cumin, caraway, and harissa. Cook until fragrant; about one minute. Remove from heat and add the cinnamon, paprika, honey, lemon juice, and preserved lemon. Salt and pepper to taste. In a large bowl, combine carrots, herbs, and feta. Pour prepared dressing over carrot mixture and toss to combine. Overall, we loved our Cooking Class Date! Not only did we have a great time together, but we learned some new cooking techniques that we can use in our everyday cooking. We are definitely looking forward to taking more classes in the future. Have you ever taken a cooking class? If so, please share your experience in the comments below! Disclosure: Sur la Table provided Mr B and me with a complimentary cooking class to facilitate this post. All opinions are 100% our own. This post may contain affiliate links, which means we may receive a commission if you click a link and purchase something that we have recommended. While clicking these links won’t cost you any extra money, they will help us keep this site up and running – and (relatively) ad-free!! Please check out our disclosure policy for more details. Thank you for your support! Fast, inexpensive, and easy to create, this Redwork Chicken Tea Towel makes a fun addition to your kitchen or a lovely, thoughtful gift. For the past week or two, I’ve been badly in need of a Craft-Fix. If you know me at all, you know that I have an entire room full of sewing, painting, drawing and other craft projects to complete. (Don’t even get me started about the writing projects that I have “in-progress.”) How about you? 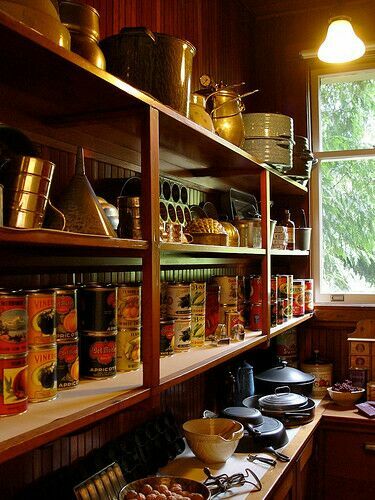 What’s in your “Project Closet”? But don’t you ever just want to start and finish a project in the same day? That’s how I’ve been feeling lately. So last week, I started cruising Pinterest for some creative inspiration, and ended up finding a huge board of old-fashioned redwork like my great-grandma used to do. Eureka! 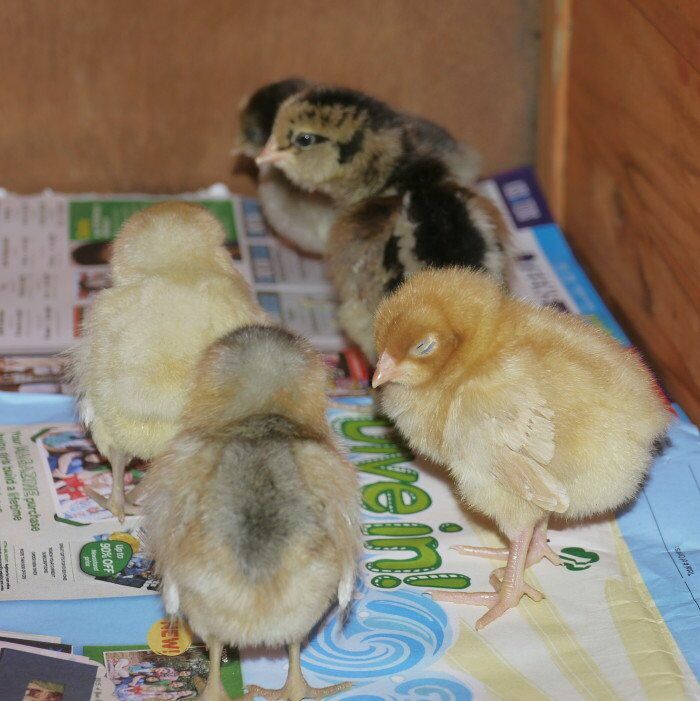 Meet Mamie Eisenhower, Hillary Rodham Clinton, Lady Bird Johnson, Rosalynn Carter, and (for all you history buffs) Harriet Lane Johnston. 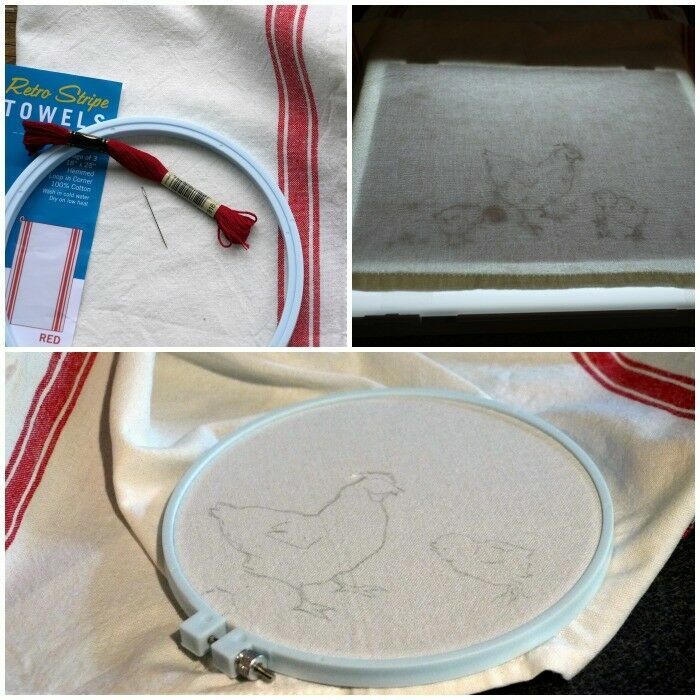 A chicken tea towel was a perfect afternoon project! Fast, inexpensive, and simple to create. Plus – so cute! Here’s my finished towel. Isn’t this just adorable? 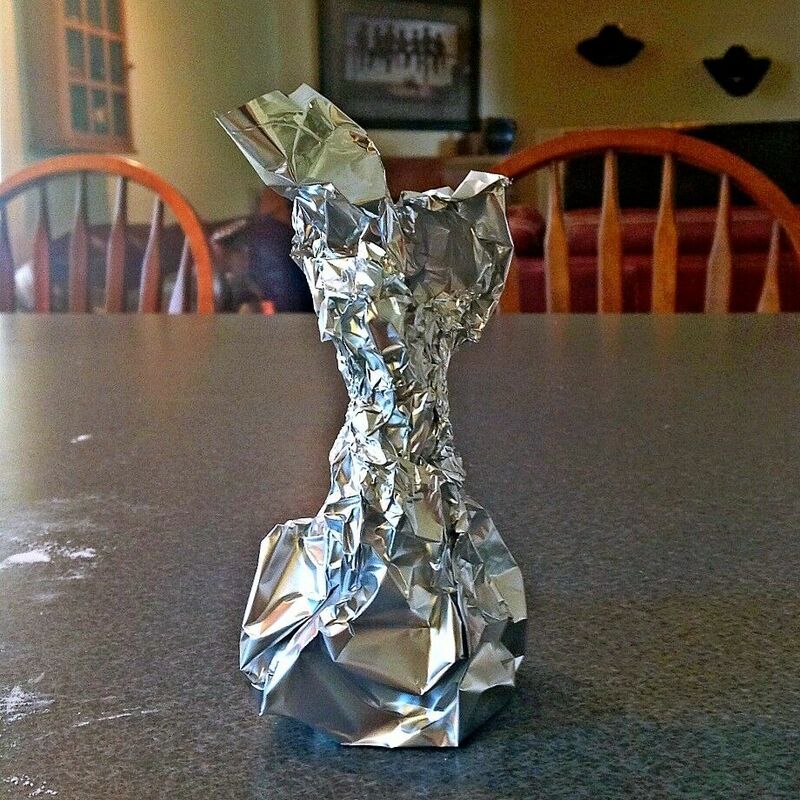 If you want to make one of these lovelies, it will cost you just a few bucks and a couple of hours. 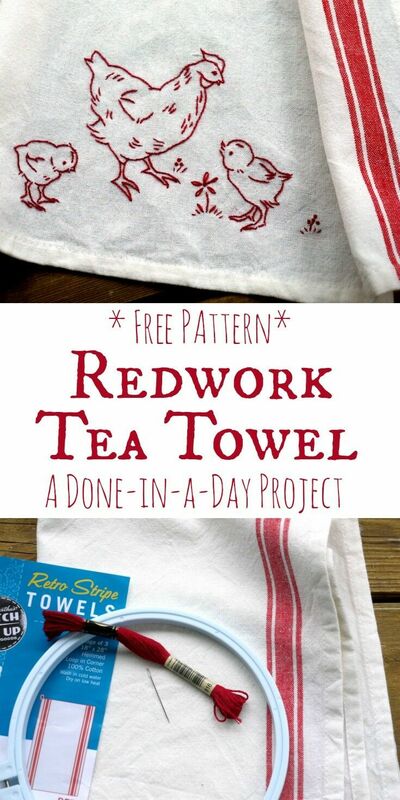 100% cotton tea towel – I used a cool retro tea towel that I bought at Joann’s (3 for about $5 with a coupon). You can also use a plain flour sack tea towel, or just make one out of muslin. Embroidery Hoop or frame – I used a 7-inch hoop, but I would have used my 5-inch if I could have found it. 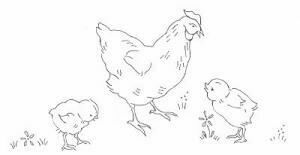 Download and print the FREE Redwork Chicken Pattern. Click on this image for pattern PDF. 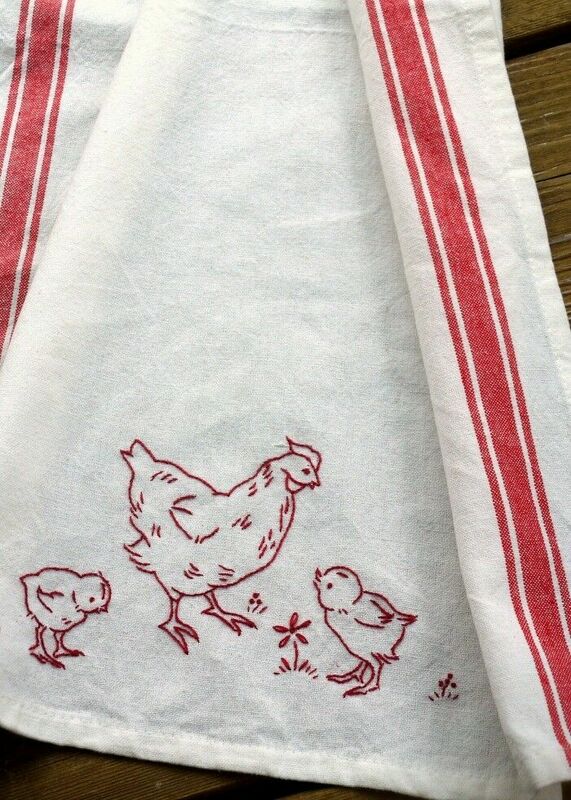 Transfer the pattern to the front of your flour sack tea towel. For a design this simple, I usually just trace the main parts of the design directly onto the fabric with a soft pencil or removable ink. You can do this by using a light table, or just holding it over a window. Hoop it up and embroider. Most of the needlework is done in a simple outline stitch using 2 strands of floss. The chicken eyes and the small flowers are worked in french knots, and the larger flowers are a french knot surrounded by lazy-daisy stitches. 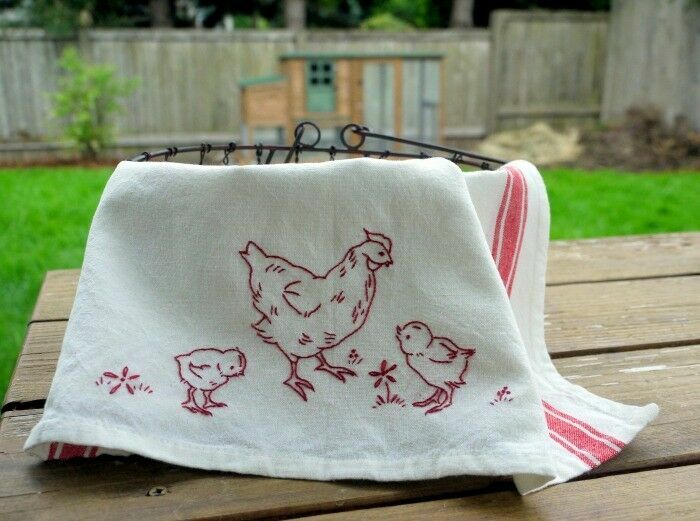 This little Redwork Chicken Tea Towel takes only a couple of hours to complete, or even less if you choose to do a smaller portion of the pattern. It is well worth the time, and makes a fun addition to your kitchen or a lovely, thoughtful gift. What if this is the year that creates the story that starts, “Hey, remember when no one made latkes…?” Or how about stockings? Make sure Santa has everything he needs to fill them. But what if you don’t? Remember that year when everyone’s stockings were filled with old Pokemon cards and leftover Halloween candy? I do. I don’t remember much about what was in our stockings all those other years, but I remember that one. Sometimes shaking up the expectation tree is a good thing (or at least makes for a great story). I have two little granddaughters who are crazy over the moon for Frozen: they are Elsa and Anna. A few months ago, their mama sent me a video of what is quite possibly the most adorable rendition of two preschoolers singing “Let It Go” that exists on the planet. (Yes, I am the Nana. I get to say things like that anytime I want to.) Anyway, the song got me thinking. About expectations. The ones we put on our friends, our kids, our parents, our spouses. On total strangers. The ones we perceive are upon us. And especially the ones we put on ourselves. Those are the worst. Just in case you are the one person on the planet who has not yet seen the Frozen movie or heard the lyrics, here is the chorus of the plot-pivoting song. Especially this time of year, it is so easy to let ourselves become a victim of our own media-fed, completely unrealistic expectations. You know… those nightly stories around the blazing fire, chestnuts roasting, cider mulling, little ones cuddled close, Grandma rocking, dog slumbering. Maybe a teenager softly playing Silent Night on the piano in the next room whilst you and your sweetheart gaze lovingly across a picture perfect tablescape to watch the snow slowly descending upon soft rolling hills as sleigh bells jingle magically in the distance. Breathe. Let it go. Then breathe again, and expect the best. Long-time residents of the Pacific Northwest will recognize our beautiful weather yesterday as the signal of our fall finale – those few brilliant, blustery days of explosive color that occur here just before a darker shade of drab begins to creep across the landscape and turn the spaces between the evergreens all brown and grey. I spent an hour of that precious sunshine at our local Farmer’s Market, sampling a few last bites of the season before the Market boss rang it out for another year. In addition to a full list of culinary vinegars, Blossom Vinegars also makes an array Drinking Vinegar Concentrates that can be used to finish a dish or as a flavoring in cocktails and sparkling water. My favorites: Mango-Habanero and Ginger-Apple Pear. This small batch, custom order bakery specializes in weddings, cakes, pastries, tarts and pies. Their pumpkin bread is killer-awesome. When you want to warm yourself up from the inside out, Portland’s own House Spirits may be your pick of the market. In the past year, this local distillery has garnered a flurry of national attention: they get high marks across the board, and I’m told that their single malt whiskey is outstanding. It’s no fun eating a warm meal if your feet are cold. Snuggly Toes make alpaca wool liners that will keep your toes warm all winter long. Do you have a Farmers Market favorite available year round? Give them a shout-out in the comments! The other day, I got an email from the representative of a local food event that basically suggested (reading between the lines) that she did not think this particular event would be interesting or valuable to me or my readers, (translation: your readers probably don’t often indulge in the kind of highfalutin cuisine we are highlighting at our fancy-pants soiree) as I am “just a home cook” and likewise, my readers are “just home cooks.” On first glance, I didn’t even pause to think about it, but a few days have passed, and her words are now scratching the edges of my brain like cat claws on a chalkboard. 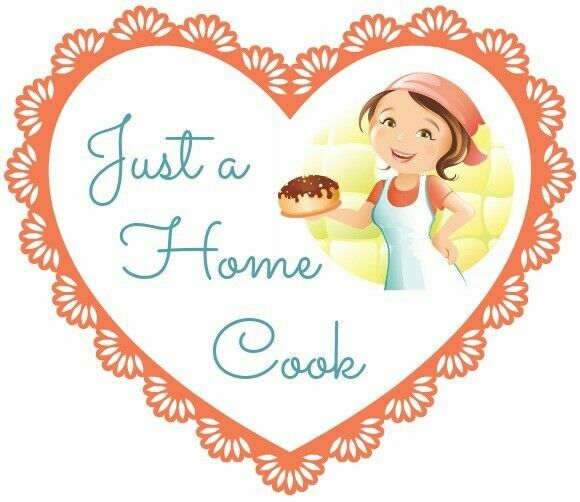 Just a home cook. “Just.” It’s that one little word that changes everything for me. I am a Home Cook. And proud of it. Long before I was a Home Cook, I was a restaurant line cook for a short time, and I’ll tell you, keeping ten or fifteen orders in your head and on the heat pales in comparison to feeding a hungry family every night, night after night, trying to keep the menu fresh week after week after week. Mr. B and I are both huge fans of Master Chef, a competitive cooking reality show, open to amateur and home chefs, hosted by a kinder, gentler version of Hell’s Kitchen’s Gordon Ramsey. (Mr. B loves Hell’s Kitchen too; me, not so much – all that beeping hurts my ears.) Over the course of the last few seasons, we have seen some pretty amazing “amateurs” create beautiful, world class food; their only formal culinary training being the experience they gained in their mothers’ kitchens. Home cooks. We taste, we test, we develop, and we get better and better. It is all about confidence and a desire to learn. A few of us even go on to become food writers, because we want to share the joy we find in our kitchens with others. Because every so often while we are experimenting, a switch flips, and we understand the science of something completely new, and for us that is a wonderful moment. I still remember the day as a child that I learned how to make perfect gravy – thick, smooth and silky – and more importantly, I understood why it happened and how to repeat it! It was nothing short of an epiphany for me. As home cooks, many of us parents, we create amid chaos, and still find great joy in making something delicious and wonderful to share with the people we love. That is what home cooking is all about. And that is not just anything. Fresh rosemary. Nothing quite like it. Beautiful, organic and free – I think everyone with a kitchen knife and a slow cooker should have a rosemary plant of their own. Mr. B takes care of our yard. He mows and weeds, fertilizes and gardens. Sometimes I help, but I’m careful to let him take charge because it is a well-documented fact that, if my thumb were a Crayola crayon, it would be a shade somewhere between Eggplant and Licorice: Plants in my care must fall into the little-to-no maintenance category if they are to have any hope for survival. Which is why I am so successful growing Rosemary. Rosemary will adapt to most growing conditions and is quite hardy. It’s happy with snow, limestone, high temperatures, by the seaside, and all sorts of soils. It will grow its best however, in a warm to hot, fairly dry climate. 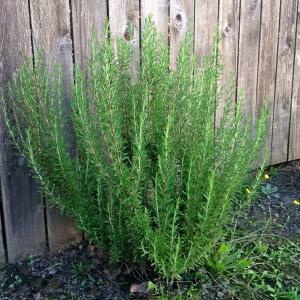 Find a good, hearty Rosemary plant. You can buy one, or ask someone who has one if you can have a clipping from theirs. Plant it in the ground (or in a pot) and water it a little. Leave it alone. Except when you need some rosemary, in which case just go out with your kitchen shears and cut some off. Then leave it alone. If the weather is unseasonably dry, give it a good soaking once a week. 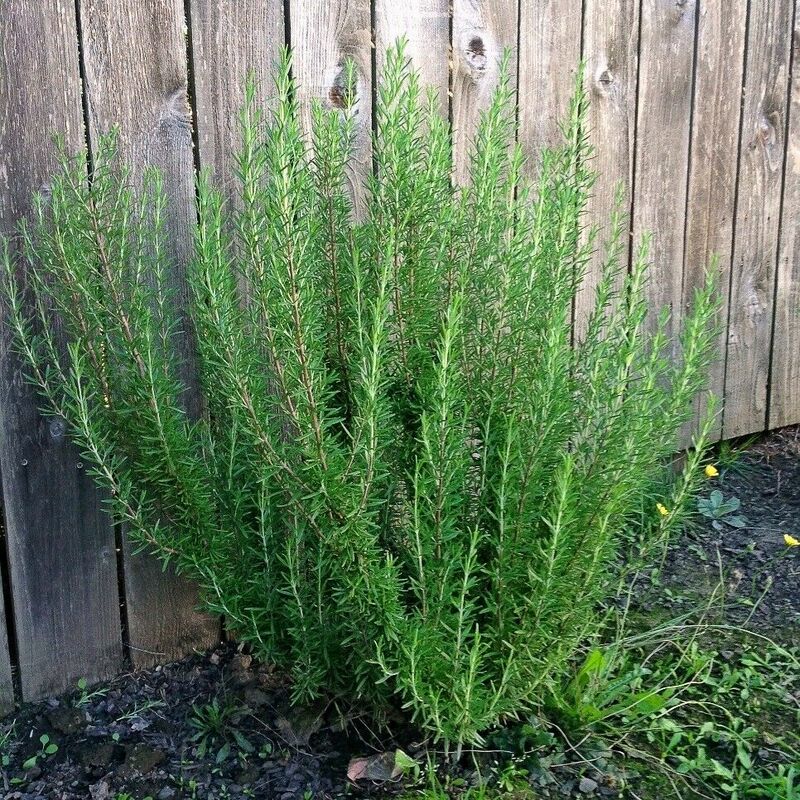 Try to avoid moving your rosemary plant once it has taken root. Disclosure: This ↑ ad bar contains affiliate links, which means we may receive a commission if you click a link and purchase something that we have recommended. (Rest assured though, we will NEVER recommend anything we don’t believe in just to make a buck. We like to sleep at night.) Anywho, while clicking these links won’t cost you any extra money, they will help us keep this site up and running – and (relatively) ad-free!! Please check out our disclosure policy for more details. Thank you for your support! Full Disclosure: I am not a Vegetarian (although I would be willing to play one on TV)! I am a Omnivore with strong Pescatarian leanings who has been living with – and cooking for – vegetarians for the last eleven years. We currently have one full-time vegetarian living at home, and at sixteen, she has already been a dedicated veggie for about seven or eight years. As compared to her previous vegetarian-sisters, she practices a relatively extreme form of vegetarianism (no offense intended) that includes avoiding ingredients like gelatin and certain red dyes, items that have required me (and my middle-aged eyes) to carefully read every flipping word on at least a million food labels with their stupid 5-point text that food manufacturers seem to be so fond of using. Vegetarian Broth – I substitute this into recipes that call for chicken stock. I make my own homemade vegetable stock so I can adjust the level of flavors for a particular dish, but when I’m out or need to buy some off the shelf, I almost always use Pacific Organic Vegetable Broth – its more reasonably priced than the upscale brands, and seems to have a far more “true” flavor than Swansons. MorningStar Farms® Original Sausage Patties – The first time I cooked these for my veggie, she made me produce the box to prove it wasn’t meat-based. 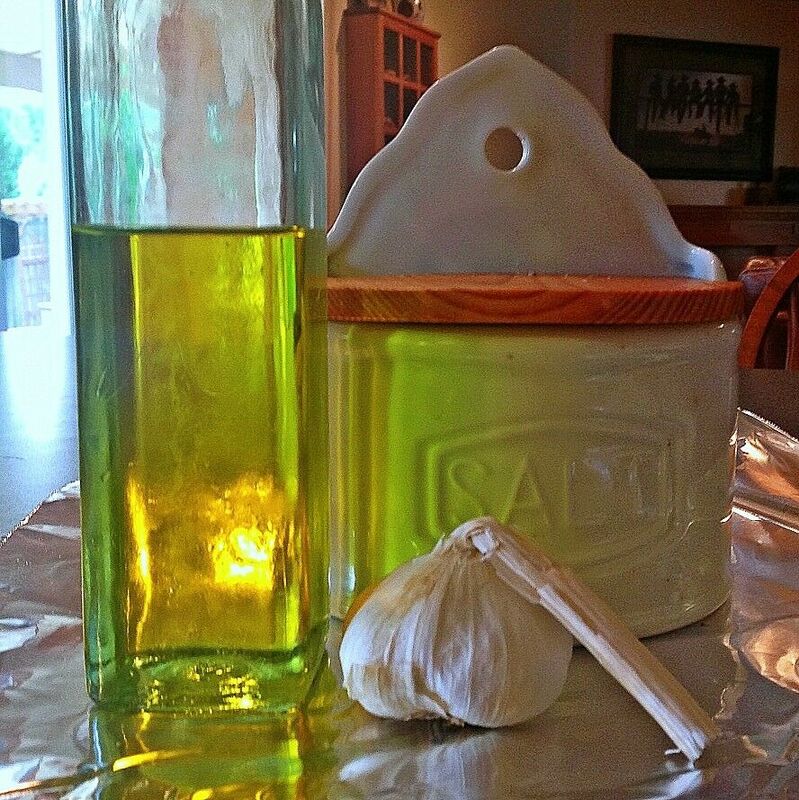 I crumble it up and use it in all kinds of casseroles and stove-top creations. Delicious. Vegetarian Worcestershire Sauce – Did you know the regular Worcestershire Sauce is not vegetarian? Well, it isn’t – it contains Anchovies, so unless your veggies are really Pescatarians, you will need to find a good vegetarian replacement. Annie’s Naturals makes a good, organic one, but there are a number of others you can try. Morningstar Farms® Meal Starters Grillers® Recipe Crumbles™ – Another win for MorningStar! (And no, I am not at this time receiving anything from MorningStar or any of their affiliates.) They’ve been in the vegetarian game now for a long time, and they know how to play it. Crumbles can be substituted into just about any recipe calling for ground beef; I often use them when I split a recipe – putting ground beef into the meat-eaters portion, and Crumbles into the veggie portion. Hearty Vegetables (e.g., eggplant, zucchini, squash, tomatoes, etc.) – Not everything is about “meat substitutes.” We cook a lot of meatless meals, and hearty vegetables are nearly always at their core. Plain Yogurt – I think this is an essential item for every kitchen. 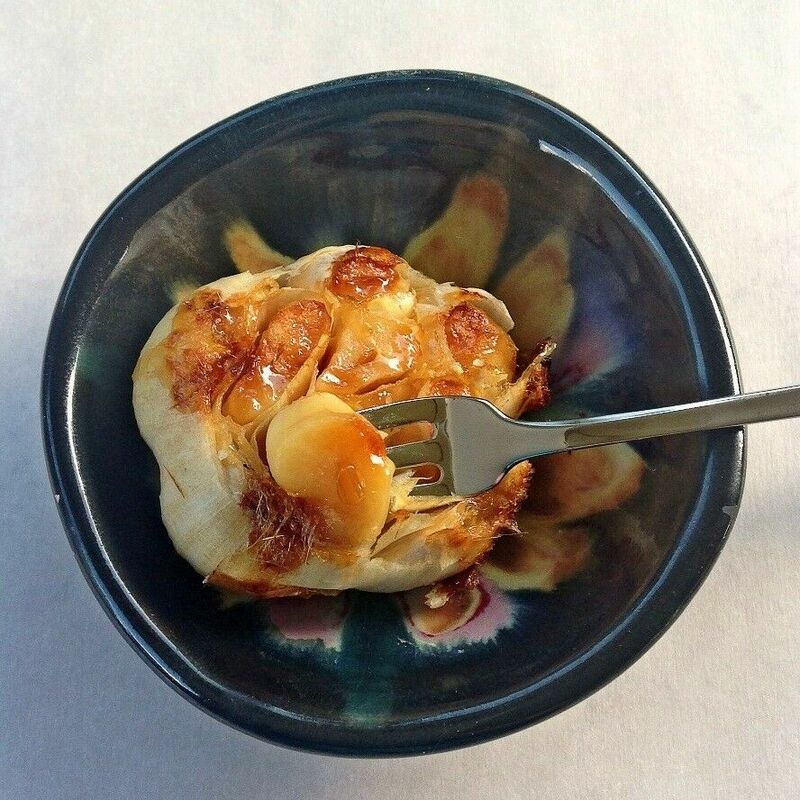 I use plain yogurt for cooking nearly every day, and it also provides a solid protein source for my Veggie. Tip: In baking, when a recipe calls for vegetable oil, you can almost always safely substitute half of the oil with plain yogurt with little or no impact on the taste and texture. My favorite is Nancy’s Lowfat Plain Yogurt.